This module allows you to set currency based on language. -You can select more than one currency for one language. 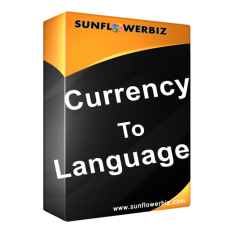 -If you only select one currency for one language, customers are forced to use this currency for this language. Note: If your table name has prefix, please change table name to [prefix]_language. -Please rename language_currency.xml_1.4.9.x-1.5.1.x or language_currency.xml_1.5.2.x-1.5.4.x under /vqmod/xml based on your opencart version to language_currency.xml and copy to your /vqmod/xml folder. -Refresh modification cache after install.